We of the Drappt are not used to these early Saturday mornings any more but James the Hat and I had decided that we’d cheer on our gallant bandmates and play in the march past, I’ve been practicing Highland Laddie after a small sherry in anticipation. Last year the nominations for Donkey were a bit thin on the ground but they’re starting to mount up this season. Just as we passed Bowling Mickey Blue Eyes appeared and asked innocuously what the fine was for forgetting a player, he’d forgotten to ask the driver to pick up Little Boots and Scooby in Erskine so as we did a big burly round the roundabout and back over the bridge he was told £10 for forgetting and £15 for turning the bus round. Seems fair. We didn’t take the bus into the park this year ‘so we could make a quick exit’, this did not chime with the plans of me and the Hat who’d been thinking ‘park close to the arena so we don’t have to carry the trophy too far in the wet’. The weather was traditional Scottish Championship driech and there was a mad rush to build the Event Shelters before the damp affected the instruments. The Event Shelters didn’t arrive with the bus due to inspired planning and a team of KPB mules had been dispatched to retrieve them, Big Mick looked livid when I turned up alone but the Young Team arrived eventually after stopping to take selfies and check their Tinder. Wee Emily asked if she could peg them down but after she’d put all the pegs in one foot wiser heads intervened. An unsecured Event Shelter is just a kite by another name. Our pipers used one to tune up in and the other was for the buffet, drummers are waterproof. After we had woken up Wee Mel and had a Gaelic coffee that could be smelt in Gourock it was time to listen to bands and one band in particular. I got landed with all the capes just before they played but managed to distribute them among younger and more gullible members. The thing with Major tournaments is you only play once unless you qualify and if the weather is more January than July there is nothing to do but shelter in the beer tent. A beer garden had been provided. I got wet. Just as the qualifiers were announced a wild storm of wind blew up and blew the announcement to Roseneath, I heard nothing and had to go and bother people standing downwind of the speakers. It wasn’t to be so a conciliatory pint was suggested. This is turning into the season of the hats but all the sunny Boaters and gay bonnets had been put away in favour of mean hombre leather waterproof numbers. This was another thing I’d remembered too late, as I stood with rain running off my nose and into my beer. 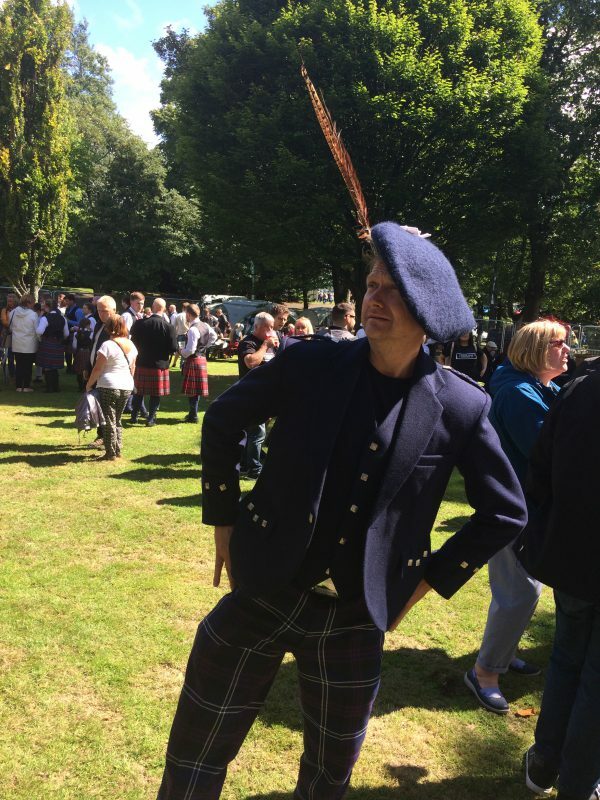 Clock (in his Great Biriani guise) borrowed a big blue Tam o Shanter bonnet with a huge feather in it and a massive chib and gave us Zoolander Tartan Steel. The man should be in catalogues. Much later in Kilbarchan Bowling Club, after a member tried to get Mickey Blue Eyes to propose to Mags by bribing him with drink and The Duke was introduced to Tony Fitzpatrick, I desperately arranged for a food delivery to try and offset the damage all day in the beer garden powered by one sausage roll had wrought. It’s amazing how you think you are the drunkest man in the room and everyone else looks fine and they think the same. August sees us overseas thrice with the Worlds thrown in for good measure. Arran next, with wasps!